Charles Hood was born in Omaha, Nebraska, and attended film school at USC. 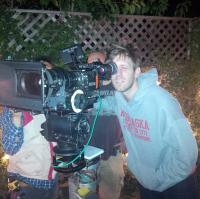 In 2007, he wrote and directed his first feature, Freezer Burn. After directing and co-writing two comedic shorts, Allison and First Kiss, he moved on to his second feature, NIGHT OWLS. Like all of his movies, Night Owls is a character-driven comedy with a dark twist.